The software have GPIO input, output , Ultrasonic sensor, i2c tmp102 temp sensor, i2c ds1307 RTC, i2c EEPROM 24c32, i2c ADS1015 12bit Analog-to-Digital Converter, i2c BMP085 Barometric Pressure/Temperature/Altitude Sensor , i2c 24x16 LED Matrix, i2c 32 channel PWM/Servo, i2c 23017 16/32/64/128 GPIO output, i2c 23017 16/32 input , 16x2 character LCD, 20x4 character LCD, 84x48 pixels monochrome LCD, Relay, Step Motor , h-bridge Motor control, spi 23s17 16/32/64/128 GPIO output, 1wire 18B20 Temp sensor , spi AD/DA mcp3002, mcp4802 . User manual and program detail in the link, Please give us feedback. Thanks! New update Ver Pi_Scratch v2.42 and User manual are ready for download now. New update Ver Pi_Scratch v2.45 and User manual are ready for download now. New update Ver Pi_Scratch v2.47 and User manual are ready for download now. New update Ver Pi_Scratch v2.57 and User manual are ready for download now. New update Ver Pi_Scratch v2.68 and User manual are ready for download . also ready for use Raspberry Pi Image include our Pi_Scratch ready for download. Last edited by tonychang-uk on Wed Jun 25, 2014 5:29 am, edited 6 times in total. That's good stuff but I'm fairly sure that calling it 'Pi Scratch' is going to confuse a lot of people. It just isn't correct - you're providing an add-on, not the base software. Please, think of a less confusing name for your package. running, while in the pull-down menu there are no additional buttons on the remote control (according to the screen in the manual). What am I doing wrong ....? the latest version from this web page is 13,Apr 2015, so this software seems not to be actively maintained. Between pi2 and pi3 have been some changes in hardware addresses, so some functions might not work by this reason, or supporting libraries are no longer available. Which special hardware or functions do you want to use which are not in current scratch+gpioserver or available by using scratchClient with scratch ? From something that Tim Rowledge said on here a while ago, and speaking briefly to Carrie-Anne Philbin at PiParty in March, it seems that RPF are not doing any more development on Scratch 1.4 and are, instead, switching their focus to providing an interface between the gpio and the online version of Scratch 2.0. I want to instill in my kids programming basics by programming small DIY kits or building a robot and then controlling it. Due to the fact that I do not want to discourage them from creating code, for example in python I decided to start from the scratch or picture language (eg scratch). Fine electronic elements I have. I managed to build a code that managed stepper motors and LEDs. On the other hand, I jammed on the remote control. The piridopia project itself is very interesting and well documented. It offers control of all the electronic modules I have. From this choice. Do you know of any similar project that easily manages so many sensors and other electrical devices? I maintain scratchClient, which is a python framework supporting a few devices as GPIO, some chips, boards and other interfaces for twitter, openweathermap, mqtt. There is no support for lirc IR at the moment. It runs with current scratch on raspbian and can easily be extended. It has a build in web server supporting low level debug of interfaces. Hello, have added lirc remote control to scratchClient today. Forris wrote: From something that Tim Rowledge said on here a while ago, and speaking briefly to Carrie-Anne Philbin at PiParty in March, it seems that RPF are not doing any more development on Scratch 1.4 and are, instead, switching their focus to providing an interface between the gpio and the online version of Scratch 2.0. From in section in the recent MagPi that seems likely to happen in a new Raspian release as that what was said. 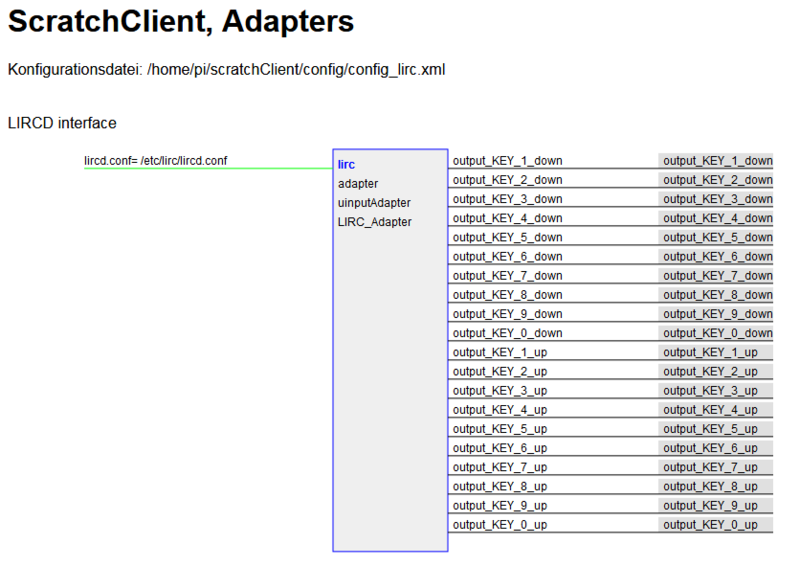 the scratchClient lirc adapter reads the configured buttons from lirc config which is in /etc/lirc/lircd.conf. So there is no need to have the buttons individually configured in the scratchClient config file. The file config/config_lirc.xml is all you need to start scratchClient (as provided in the download). When you open the web page localhost:8080, then you should see an adapter displayed similiar to this in docs chapter 6.12.2.5. Each key in lirc provides a broadcast e.g. for key_3 there are the events output_key_3_down and output_key_3_up. When scratch 1.4 is connected to scratchClient (enable remote sensor connections), then the web page is animated. So the outputs will show a short red flash when lirc triggers a button (monitoring), and if you click the output text with the mouse, the corresponding event will be send to scratch (simulation). scratch1.4 has the 'when I receive '-hat in the control panel. Either type or paste the broadcast event name from the web page, or (if lirc is working) just press the buttons on your remote control, then scratchClient sends the events to scratch and scratch 1.4 populates the event name in the hat's value selection. ... one more question ... when I want to spend a few configuration files (several servo functions, lirc, photo sensor) in one time how do I run scratchclient ...? Do you need to merge several configuration files into one ....? a config file consists of one or more <adapter/> - sections. Just add the adapters as needed. Usually the adapters work without problems when combined, but be careful not to use various pwm technolgies or setting the poll rates too fast. There are some constraints e.g. on naming the adapters (each one unique), so read the log output for errors. Hello, servo usually have black (dark), red and yellow connectors. Connect 5V between black and red; connect black to rpi gnd and yellow to a gpio pin. For very small servo, it is possible to take the 5V from the gpio headers, for larger servos there is the need for an extra power supply. There are config snippets in the doku and sample files in the distro. Are you certain you are using the correct pin numbers? Don't forget that the built in scratch gpio server uses the BCM numbering. See https://pinout.xyz for a collection of illustrations about the pin numbering and usages. I wrote that code, and the documentation, and the example Scratch project (Examples->Sensors and Motors->gpio-servoDemo) and it certainly works in my lab. Here a sample config and step by step procedure for servo with scratchClient. Copy this as a file config/config_gpio_servo.xml into the scratchClient folder. You see in the xml file that the PWM pin is BCM-GPIO23, adjust as needed. This adapter uses rpi.gpio, which has some jitter but should work without more dependencies. The -v flag makes output more verbose. Keep the terminal open. 2017-06-08 19:49:33,688 - __main__ - INFO - Trying to connect to scratch. 2017-06-08 19:49:33,838 - __main__ - WARNING - There was an error connecting to Scratch! 2017-06-08 19:49:33,838 - __main__ - WARNING -   Unterstuetzung fuer Netzwerksensoren einschalten! 2017-06-08 19:49:33,838 - __main__ - WARNING -   Activate remote sensor connections! 2017-06-08 19:50:30,369 - __main__ - INFO - Connected to Scratch ! Now, in scratch, create a variable 'servo_A' exactly as written here (upper, lowercase, underscore, no blanks). You see this name in the xml file in <variable name='servo_A'/>. Set values for this variable from 0..100 and the servo should move. To doublecheck the connection, open localhost:8080 in a browser on the pi, and navigate to adapters. There you should see a box with the input values you set by scratch. This validates that the connection from scratch to scratchClient is working. If there are problems, pls copy the scratchClient output error messages (if any) and put this to the forum. For the scratch2 connections (coming soon) this will be simpler, as the blocks are created from the config. Question what is the reason ....? one problem caused by a wrong formatting in an error message. It is corrected, pls download latest distribution.. The root cause is the naming of the gpio pin in the config file. Use 'GPIO00' (two zeros) till 'GPIO31' in upper case, no blanks. And only these BCM numbers which are available on the pi. Think you have a misspelling in the name. scratchClient allows renaming of these port names. As there are pin oriented tutorials, people using wiringpi or BCM numbering worlds, I thought it useful to not force someone to other conventions. And there is my school course, where the adapter board has its own numbering too. See config/portmapping.xml to get an idea on how this works. Internally scratchGPIO works with bcm numbers only. The other error is also a place where I recently changed code. Is also corrected in current download. Sorry for the problems with this. 2017-06-12 22:53:37,215 - __main__ - INFO - Trying to connect to scratch. 2017-06-12 22:53:37,216 - __main__ - INFO - Connected to Scratch !